Cruises are great vacations. From the moment you step on board, you don’t have to worry about a thing – you only have to unpack your bag once, you never have to wonder where and when you’ll have your next meal, and you can enjoy night time entertainment just steps away from your room. But in order to make sure you’re allowed to board, you’d better check your passport to make sure you have the right travel documentation to embark! 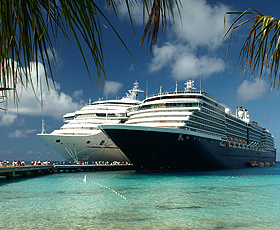 In this article, we’ll go over the passport needs for US citizens for popular types of cruises. You may have heard the term “closed-loop cruise” in reference to Caribbean cruises – this means that your cruise begins and ends at the same port in the US. You will need to have proof of your US citizenship to board. A passport is the best way to prove citizenship, but an original birth certificate showing birth in the US (along with a valid driver’s license) is also considered proof of citizenship. All cruise lines recommend that passengers have a passport book valid for at least six months past the end of the cruise. See below for the reasons for this recommendation. Alaska is a US state, so you don’t need a passport to enter. However, if your cruise itinerary has you departing from Vancouver or visiting any other Canadian port, you will need to have a valid passport book or passport card. If you are flying to Canada to begin your cruise, you absolutely must have a valid passport book. Cruises with ports of call in Mexico may fall into the category of “closed-loop cruise,” with the same requirements listed above for Caribbean cruises. However, all passengers are strongly recommended to have a passport book with at least six months validity remaining. If your cruise will make any stops in South America, you must have a valid passport book with at least six months validity. Some South America cruises include ports of call in Brazil, and you must have a valid Brazil visa in order to get off the ship or take any shore excursions in Brazil. Brazil visas must be obtained at a consulate in the United States well in advance of your cruise. You must have a US passport book valid for at least six months past the end of your trip for any cruise that begins, ends, or includes ports of call in Europe. If you are taking a Baltic Cruise that includes a stop in St. Petersburg, you must be aware of the visa requirements for Russia. If you take a shore excursion into St. Petersburg that is organized by your cruise line, and you will be on Russian soil for less than 12 hours, you will be covered under the cruise line’s “blanket visa” and you will not need to get a visa in advance. However, if you will spend one or more nights off the ship in Russia, or even if you just want to explore the city on your own for a few hours or take a tour that is not sponsored by the cruise line, you must have a valid Russian visa. This Russian visa must be obtained in advance of travel. Why Should I Have a Passport for a Closed-Loop Cruise? You miss your cruise departure, either at your embarkation port or at one of the destination ports, and have to fly to the first port of call to catch up with the ship. You become seriously ill or injured during the cruise, and need to fly back to the US for medical treatment. You need to return to the United States urgently due to a family emergency or business issue. Your cruise is forced to end at a different port due to weather or mechanical issues, and all passengers must be flown back to the original port of departure. So check your passport now, and be prepared for a wonderful cruise experience!